The council responsible for the care of a five-year-old girl who was placed with Muslim foster family has rejected concerns about her treatment.The Times alleged the Christian girl's foster carers stopped her from eating bacon, told her to learn Arabic and removed a crucifix necklace from her.Tower Hamlets Council has rejected the allegations following an investigation.The child, who was put into care due to concerns about her biological mother's welfare, now lives with a grandmother.She was placed into the Muslim foster family's care in March by the London Borough of Tower Hamlets. However, in August, the Times newspaper published a story claiming she had been "forced to live with a niqab-wearing foster carer".The paper reported the girl had "sobbed and begged" not to return to the family because "they don't speak English".She also allegedly told her biological mother that "Christmas and Easter are stupid" and "European women are stupid and alcoholic".However, Tower Hamlets Council - which investigated the claims - said the allegations were unsubstantiated and the girl did not know what Europe was. A report by a senior social worker said the child had "expressed no negative views about Christmas, Easter or any religious festival" when questioned. 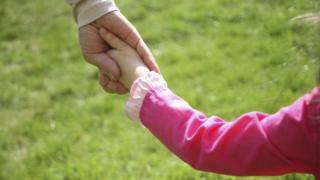 The five-year-old is currently living with her maternal grandmother, who the council said was "distressed and angered" by the "false" allegations against the foster carers. "She has a good relationship with the carers and is grateful for the excellent care she says that they have provided to the child," the report added.Lawyers for the child's mother agreed the social worker's findings were "an accurate representation of the outcome of the council's investigation," a Tower Hamlets spokesman added. According to the report, the girl's grandmother wants to take the child to her country of origin, which cannot be named for legal reasons. East London family court previously heard the girl had a "warm and appropriate" relationship with her foster carers, and missed them after she went to live with her grandmother.Judge Khatun Sapnara said: "The local authority has satisfied itself that the foster carer has not behaved in any way which is inconsistent with their provision of warm and appropriate care for the child. "The judge will decide after a further hearing next month whether the child stays with her maternal grandmother.The BBC has contacted the Times for comment.